General Dynamics (NYSE: GD) today reported full-year earnings from continuing operations of $3.4 billion on revenue of $36.2 billion, and quarterly earnings from continuing operations of $909 million on $10.4 billion in revenue. Year-over-year revenue grew in all five segments. "General Dynamics delivered solid performance in 2018," said Phebe N. Novakovic, chairman and chief executive officer. "Our Aerospace segment successfully managed through a new model transition while achieving good order intake. Our defense businesses had strong operating performance and continued to book significant new business." 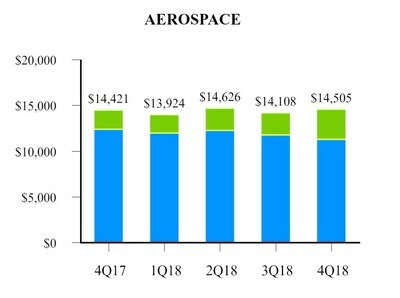 Aerospace's 2018 full-year revenue was $8.5 billion, with operating earnings of $1.5 billion and an operating margin of 17.6 percent, even with its ongoing transition to new aircraft models. Book-to-bill was 0.8-to-1.0 for the quarter and 0.9-to-1.0 for the year. Gulfstream delivered the first all-new G500 in the third quarter and continued G500 deliveries in the fourth quarter. 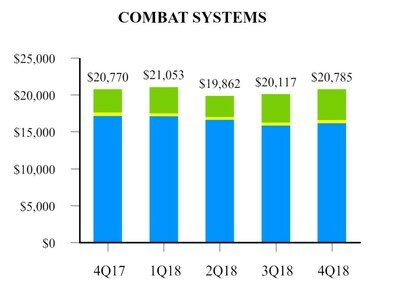 Combat Systems reported 2018 full-year revenue of $6.2 billion, up 4.9 percent over 2017. Operating earnings were $962 million and operating margin was 15.4 percent. The group achieved a book-to-bill of 1.3-to-1.0 for the fourth quarter, building on significant awards earlier in the year including M1A2 Abrams tank upgrades and additional Stryker double-V-hull vehicles. The group was also selected to deliver prototype vehicles for the U.S. Army's Mobile Protected Firepower (MPF) program. 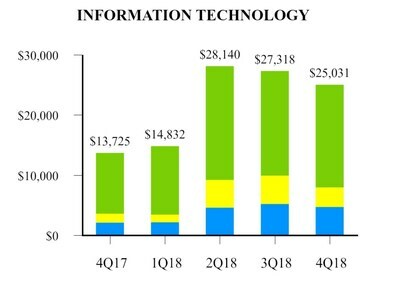 Information Technology had 2018 full-year revenue of $8.3 billion, up 87.5 percent over 2017 and up 4.3 percent excluding the acquisition of CSRA. 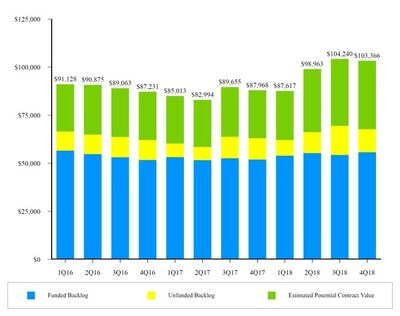 Operating earnings for the year were $608 million, up 63 percent over 2017. The combination of General Dynamics Information Technology and CSRA in the second quarter created a premier service provider to customers across defense, intelligence and federal civilian markets. The group achieved a book-to-bill of 1.0-to-1.0 for the year, with $8 billion in backlog and $25 billion in total estimated contract value. 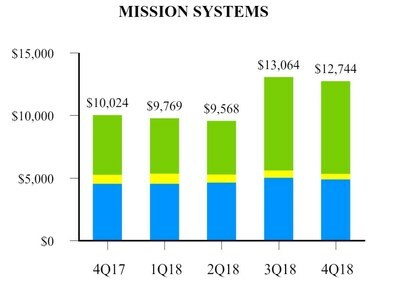 Mission Systems' 2018 full-year revenue was $4.7 billion, up 5.5 percent over 2017. Operating earnings were $659 million, up 3.3 percent over 2017. Operating margin for the year was 13.9 percent. The group had a book-to-bill of 1.0-to-1.0 for the year, with many significant orders including a $3.9 billion maximum potential indefinite delivery, indefinite quantity (IDIQ) contract for the U.S. Army's Common Hardware Systems-5 (CHS-5) program. 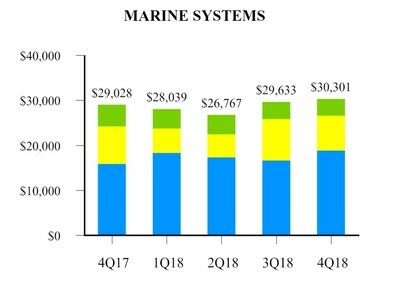 Marine Systems reported 2018 full-year revenue of $8.5 billion, up 6.2 percent over 2017. Operating earnings grew by 11.1 percent to $761 million, and operating margin for the year expanded 40 basis points to 9 percent. In 2018, the segment won several key contracts as well as $607 million in contract modifications on its $6.1 billion potential value contract to perform design and development work for the Columbia ballistic missile submarine. Book-to-bill grew year-over-year from 1.2-to-1.0 to 1.3-to-1.0. Net cash provided by operating activities for the year totaled $3.1 billion. Free cash flow from operations, defined as net cash provided by operating activities less capital expenditures, was $2.5 billion in 2018, after a $255 million discretionary pension plan contribution. The company repurchased 7.6 million of its outstanding shares in the fourth quarter of 2018, and 10.1 million of its outstanding shares for $1.8 billion for the year. The company paid out $1.1 billion in dividends in 2018. Total backlog at the end of 2018 was $67.9 billion, up 7.4 percent from 2017. The estimated potential contract value, representing management's estimate of value in unfunded IDIQ contracts and unexercised options, was $35.5 billion, up 43.2 percent from 2017. Total estimated contract value, the sum of all backlog components, was $103.4 billion, up 17.5 percent from 2017. Orders remained strong across the company with a consolidated book-to-bill of 1.0-to-1.0 for the year. Headquartered in Falls Church, Virginia, General Dynamics is a global aerospace and defense company that offers a broad portfolio of products and services in business aviation; combat vehicles, weapons systems and munitions; IT services; C4ISR solutions; and shipbuilding and ship repair. The company's 2018 revenue was $36.2 billion. More information is available at www.generaldynamics.com. Certain statements made in this press release, including any statements as to future results of operations and financial projections, may constitute "forward-looking statements" within the meaning of the Private Securities Litigation Reform Act of 1995, as amended. Forward-looking statements are based on management's expectations, estimates, projections and assumptions. These statements are not guarantees of future performance and involve risks and uncertainties that are difficult to predict. Therefore, actual future results and trends may differ materially from what is forecast in forward-looking statements due to a variety of factors. Additional information regarding these factors is contained in the company's filings with the Securities and Exchange Commission, including, without limitation, its Annual Report on Form 10-K and its Quarterly Reports on Form 10-Q. All forward-looking statements speak only as of the date they were made. The company does not undertake any obligation to update or publicly release any revisions to forward-looking statements to reflect events, circumstances or changes in expectations after the date of this press release. WEBCAST INFORMATION: General Dynamics will webcast its fourth-quarter and full-year 2018 financial results conference call at 9 a.m. EST on Wednesday, January 30, 2019. The webcast will be a listen-only audio event available at www.generaldynamics.com. An on-demand replay of the webcast will be available by 12 p.m. on January 30 and will continue for 12 months. To hear a recording of the conference call by telephone, please call 877-344-7529 (international: 412-317-0088); passcode 10127475. The phone replay will be available through February 6, 2019. Charts furnished to investors and securities analysts in connection with General Dynamics' announcement of its financial results for the quarter and year ended December 31, 2018, are available on its website at www.generaldynamics.com. General Dynamics intends to supplement those charts on its website after its earnings call today to include information about 2019 guidance presented on its earnings call. Prior-period information has been restated for the adoption of Accounting Standards Update (ASU) 2017-07, Compensation - Retirement Benefits (Topic 715): Improving the Presentation of Net Periodic Pension Cost and Net Periodic Postretirement Benefit Cost, which we adopted on January 1, 2018. 2018 results include the unfavorable impact of one-time charges of approximately $75 associated with costs to complete the acquisition of CSRA Inc. In the table above, approximately $45 of compensation-related costs was reported in operating costs and expenses, and approximately $30 of transaction costs was reported in other, net. Prior-period information has been restated for the adoption of ASU 2017-07, which we adopted on January 1, 2018. 2018 results include the unfavorable impact of approximately $45 of compensation-related one-time charges associated with costs to complete the acquisition of CSRA Inc. This amount was reported as a reduction of Corporate operating earnings in the table above. Notes describing the calculation of the other financial information and a reconciliation of non-GAAP financial measures are on the following page. Return on equity is calculated by dividing earnings from continuing operations for the latest 12-month period by our average equity during that period. Includes independent research and development and Aerospace product-development costs. We believe earnings before interest, taxes, depreciation and amortization (EBITDA) is a useful measure for investors because it provides another measure of our profitability and our ability to service our debt. We calculate EBITDA by adding back interest, taxes, depreciation and amortization to earnings from continuing operations. The most directly comparable GAAP measure to EBITDA is earnings from continuing operations. We believe free cash flow from operations is a useful measure for investors because it portrays our ability to generate cash from our businesses for purposes such as repaying maturing debt, funding business acquisitions, repurchasing our common stock and paying dividends. We use free cash flow from operations to assess the quality of our earnings and as a key performance measure in evaluating management. The most directly comparable GAAP measure to free cash flow from operations is net cash provided by operating activities. We believe return on invested capital (ROIC) is a useful measure for investors because it reflects our ability to generate returns from the capital we have deployed in our operations. We use ROIC to evaluate investment decisions and as a performance measure in evaluating management. We define ROIC as net operating profit after taxes divided by average invested capital. Net operating profit after taxes is defined as earnings from continuing operations plus after-tax interest and amortization expense, calculated using the statutory federal income tax rate. Average invested capital is defined as the sum of the average debt and shareholders' equity excluding accumulated other comprehensive loss. ROIC excludes goodwill impairments and non-economic accounting changes as they are not reflective of company performance. The most directly comparable GAAP measure to net operating profit after taxes is earnings from continuing operations. The estimated potential contract value includes work awarded on unfunded indefinite delivery, indefinite quantity (IDIQ) contracts and unexercised options associated with existing firm contracts, including options and other agreements with existing customers to purchase new aircraft and aircraft services. We recognize options in backlog when the customer exercises the option and establishes a firm order. For IDIQ contracts, we evaluate the amount of funding we expect to receive and include this amount in our estimated potential contract value. The actual amount of funding received in the future may be higher or lower than our estimate of potential contract value. $715 from the U.S. Army to upgrade Abrams tanks to the M1A2 System Enhancement Package Version 3 configuration. $385 from the Army for additional Stryker double-V-hull vehicles. $335 from the Army to develop and deliver 12 prototype vehicles for the Mobile Protected Firepower (MPF) program. $95 for the production of Army Ground Mobility Vehicles (AGMVs) and associated kits. $45 from the Army for the production of Abrams Expedited Active Protection System (ExAPS) armored mounting kits and ballast kits. $45 to supply 155mm ammunition to the Australian Department of Defence. $140 for several key contracts to provide intelligence services to classified customers. $105 from the National Geospatial-Intelligence Agency (NGA) for information technology (IT) lifecycle management and virtual desktop services. $50 to provide operations and maintenance support services for the Transportation Security Administration (TSA). $45 to provide IT, information assurance and cybersecurity services for the F-35 Joint Strike Fighter Virtual Enterprise network and workstations. $40 to provide IT management and support services for two cloud-based infrastructure locations. $30 to provide operations and maintenance support services for a Department of Homeland Security (DHS) data center. $185 from the U.S. Navy for combat and seaframe control systems on Independence-variant Littoral Combat Ships. $90 from the Navy to provide fire control system modifications for ballistic-missile (SSBN) and guided-missile (SSGN) submarines. $80 from the Army for computing and communications equipment under the Common Hardware Systems-5 (CHS-5) program. $55 to provide engineering, integration and software support services for the Canadian Army's Land Command, Control, Communications, Computers, Intelligence, Surveillance and Reconnaissance (C4ISR) System. $35 to build circuit card assemblies for the Trident missile D5 life extension program. $30 to provide equipment and installation of video surveillance receivers for the Federal Bureau of Investigation (FBI). $925 from the Navy for the design and construction of two T-AO-205 fleet replenishment oilers and long-lead materials for a third T-AO-205 oiler. $910 from the Navy for the construction of an Arleigh Burke-class (DDG-51) guided-missile destroyer. $350 from the Navy to provide design and development and lead yard services for Virginia-class submarines. $180 from the Navy for Advanced Nuclear Plant Studies (ANPS) in support of the Columbia-class submarine program. $70 from the Navy for design, planning yard, engineering and technical support services for in-service nuclear submarines. $45 from the Navy to provide non-nuclear maintenance and repair services for submarines located at the Naval Submarine Support Facility in New London, Connecticut. Does not include contract amendments, customer defaults, pricing adjustments, liquidated damages, cancellations, foreign exchange fluctuations and other backlog adjustments.